Teddie L. Davenport, son of Lawrence and Robbie Davenport, born Sept. 25, 1952 in Crittenden Co., KY, died Sept. 30, 2008 at 4:06 p.m. at Vanderbilt in Nashville. He suffered serious injuries on Friday when he had a heart attack at the wheel of his vehicle, losing control and exiting the roadway at the Crittenden-Lyon county line on Hwy. 295. He was ejected from the driver's side window. Several emergency personnel responded and he was air lifted to Western Baptist Hospital in Paducah and later transferred to Nashville. His family extend their thanks to everyone for their prayers during this time of loss. The 44th annual L.B. and Sarah A. (Parsley) Patton Family Reunion will be held Sunday, October 12, 2008 at the Fredonia Lion’s Club Building (next to the water tower) in Fredonia, Ky. Mark your calendars now for this important gathering. It isn’t often we get to share quality time with the extended family! The reunion begins around 12 noon, and will include a potluck. Please bring a dish or two for the entire family to enjoy! In case a flyer has not been mailed to your family member, please let him or her know soon! The day will include door prizes and giveaways and an afternoon of visiting and fellowship for all! Volunteers are needed for a very short amount of time during the morning of October 11 to run the children's games at Dycusburg Day. Please give back to the community by helping! We only need an hour of your time ... and it will be fun! We also need unique or antique cars and trucks (or tractors or anything else!) for the parade at noon. 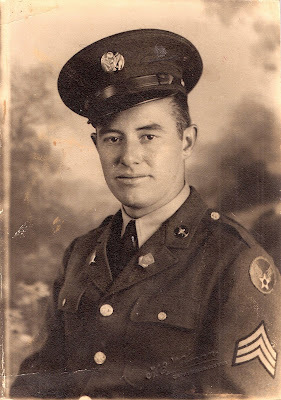 Please e-mail matthewtpatton@yahoo.com to help out! For a limited time, Dycusburg, Kentucky: A Glance at Her Past is available for purchase for $50 (regularly $75). Please e-mail matthewtpatton@yahoo.com if you would like to reserve a copy. Only 8 remain as of September 29, 2008. P.K. 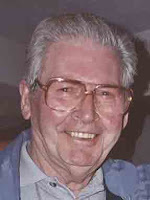 Cooksey, surviving partner of W.L. 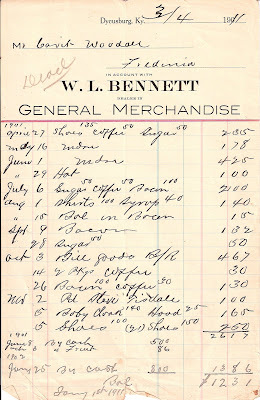 Bennett in the mercantile business at Dycusburg, sent notices to several in the area insisting upon payment. 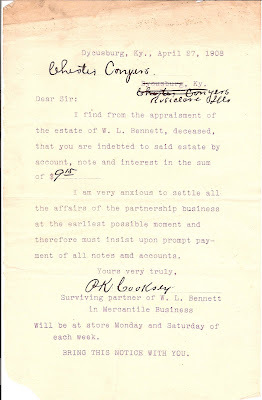 Below is one note to Chester Conyers (dated April 27, 1908) who was living in Rosiclare, IL. Click image for larger version. I am seeking any and all information and anecdotes about the Dycusburg City Hall (pictured; click for larger version). Please e-mail me at matthewtpatton@yahoo.com if you have information. A serious accident occurred earlier today at the Crittenden-Lyon county line (Hwy. 295) just outside of Dycusburg. Teddy Davenport's vehicle exited the road and Davenport was reportedly ejected from his vehicle. 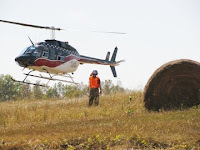 Several emergency personnel responded to the scene (photo at right courtesy of The Crittenden Press) and Davenport was air lifted to Western Baptist Hospital in Paducah then later to Vanderbilt in Nashville. According to his sister, his injuries are very extensive. The Davenport family requests your prayers during this time of need. 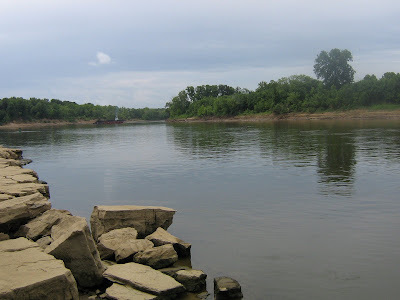 Michelle Henderson provided these photos from a few weeks ago when the Cumberland River levels rapidly dropped. These were taken at Dycusburg. Click photo for larger version. The home of the Jason Rushing family recently burned (adjacent to Seven Springs Missionary Baptist Church). Life seems to be getting back to normal after the storm that hit in the wake of Hurricane Ike. Many in this area banded together to help one another. Smashed cars and homes, peeled roofs and broken fences were a sobering after effect of the strong, seemingly unforgiving winds. Losing a luxury like electricity sometimes jolts us back into a realization that, in times of need, a sense of community is that much more important. In the past week, area residents have enjoyed gorgeous weather. This has meant many have enjoyed cookouts and camping. Paul Rushing is out of the hospital. Our sympathies are extended to the family of Jimmie Manley. Birthday wishes are extended to Sandra Peek Tabor (Sept. 22), and to Juanita Green and Linda Sutton. Anniversary congratulations to Byron and Sue Powell; Josh and Star Mahns (4 years on Sept. 25); and Rick and Debbie Holsapple (33 years on Sept. 27). Thank you to everyone who has complimented our column lately. We admit that we enjoy the praise and faithful readers. We are enjoying writing this column every week. The best comment that hit our inbox this week hit the nail on the head, stating that Dycusburg always had a bad reputation but it was never as bad as people made it out to be. Amen to that! 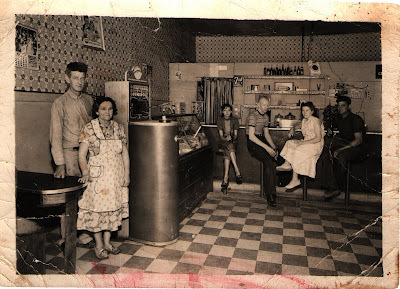 Barbara Ethridge recently enjoyed visiting on the phone with Virginia Lee Jewell and talking about local history. Homecoming at the Dycusburg Baptist Church was well attended. Bro. Cliff Paddock, Jr., spoke and The Hamptons gave a concert. 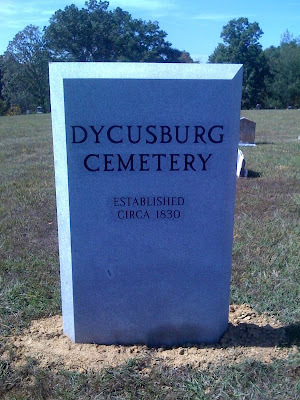 The new marker has been erected at the entrance of the Dycusburg Cemetery. Dycusburg Day is quickly approaching. Dear readers, here's what we need: volunteers to run childrens' games in the morning (our biggest need); antique and unique cars for our parade at noon; and craft and food vendors. Please contact Michelle Henderson at 270-988-2758 or Matthew T. Patton at 215-285-0920 if you would like to help us make our day a huge success. 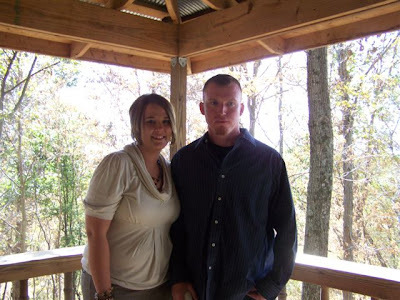 The Dycusburg Community Group will meet this Sunday at 3 p.m. at the home of Michelle Henderson. All in the area interested in the advancement of the town are invited. The Dycusburg Community Group urges residents of the town to spruce up their yards in advance of Dycusburg Day. The teamwork before our last event in July was apparent, and we hope to see a similar effort this time around. The silent auction at Dycusburg Day has some fabulous items worth checking out, including a movie lover's package, gift certificates to local restaurants, a baby clothes set, autographed books, magazine subscriptions, bed and breakfast stays, CDs, and more. We will publish the full list of silent auction items at www.dycusburg.com/dcg soon. Bring plenty of cash or a checkbook on October 11 as you won't want to miss out on the opportunity to bid on these amazing items. Additionally, a $100 Visa gift card, Avon basket and a loaded Nashville getaway package will be raffled off during the day. All proceeds will benefit the nonprofit Dycusburg Community Group. Just by attending, you can enter for some free door prizes, including a food gift basket and a $50 gift certificate to Patti's Restaurant. Representatives from WAVJ were in Dycusburg testing signal strength last week. They will be broadcasting from Dycusburg Day. In conjunction with Dycusburg Day, the Crittenden County Genealogical Society will hold its October 11 meeting at the Dycusburg Methodist Church (after a short business meeting at the Crittenden County Library at 10). Matthew T. Patton, author of Dycusburg, Kentucky: A Glance at Her Past will provide an overview of the town's history, followed by a visit to the Dycusburg Area Veteran's Memorial and then a walking tour of Dycusburg Cemetery. Attendees of this function will be entered into a raffle to receive a free copy of Patton's book, free subscriptions to Kentucky Monthly and Kentucky Explorer magazines, as well as a complimentary membership to the Crittenden County Genealogical Society. The annual L.B. and Sarah (Parsley) Patton family reunion will be held Sunday, October 12 at the Fredonia Lion's Club Building, starting at noon. A potluck lunch will be served at 12:45. All descendants and friends of the family are welcome. Attendance at Seven Springs for Sunday School was 47 with many more arriving for preaching. Share your news. Email dycusburg@yahoo.com. The windstorm on Sunday left many in this area in the dark when the remnants of Hurricane Ike passed through the area. All throughout the area, trees were downed, including some over homes and cars. Several reported devastating damage to property. It's clear the cleanup efforts will take quite some time. Happy belated birthday to Vern Huff (Sept. 12). Dycusburg Grocery will be hosting karaoke on Fridays, and continues to host bingo on Thursdays and Saturdays. Bingo proceeds are donated to the fireworks fund for Independence Day celebrations. 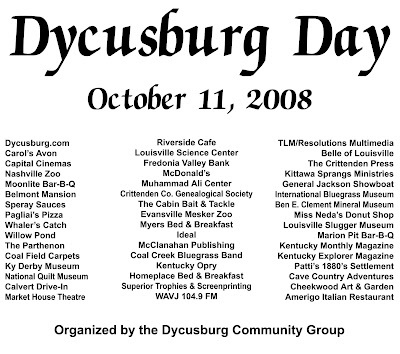 If you haven't had a chance to do so, please review the lineup of activities for Dycusburg Day (Oct. 11) at www.dycusburg.com/dcg. 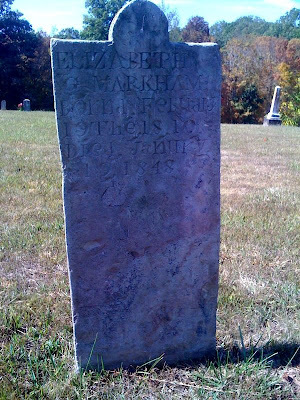 Do you think you may have an ancestor who served in the American Revolution? If you do and can prove your lineage, you are eligible to join the Daughters or Sons of the American Revolution. It's a great way to honor your ancestors, and several from this area definitely descend from a Revolutionary War patriot. For tips on how to get started, e-mail matthewtpatton@yahoo.com. Remnants of Hurricane Ike battered Crittenden County on Sunday, and damage was widespread. 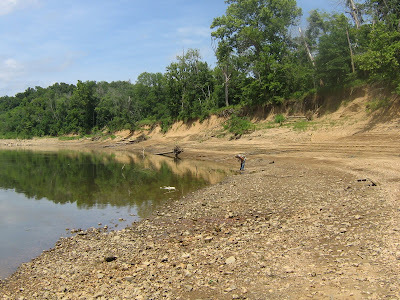 These photos are of the Ken Boling property at Dycusburg (top two) and the Shewcraft house between Frances and Dycusburg. For more information about the storm, visit www.the-press.com. Photos courtesy of The Crittenden Press. (Click photos for larger versions). A few more notes shared by Brenda Joyce Jerome. 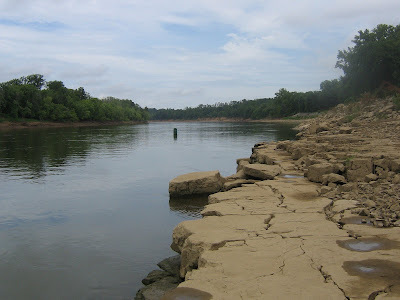 Book H, p. 260, Mon., 6 Apr 1835 : On motion of John W. Simpson & it appearing that he is the owner of the land, it is therefore ordered that a ferry be granted him across the Cumberland River about three quarters of a mile below the mouth of Livingston Creek, from this shore to the other side and back. 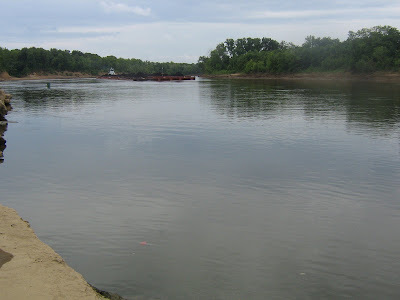 Book H, p. 261, Mon., 6 Apr 1835: On motion of William K. Pickens, and it appearing he is the owner of the land, It is therefore ordered that a ferry be granted him across the Cumberland River opposite Travis’ old ferry from this shore to the other side. Fellow genealogist Brenda Joyce Jerome pointed out a few things regarding the ferry at Dycusburg. (Check out her site at http://wkygenealogy.blogspot.com). She explained that military land grants in this part of western Kentucky were reserved for soldiers and officers of the Virginia Continental Line. "These military grants stopped before 1800 (I think it was 1798) and the lands were then thrown open for purchase by anyone who could meet the constantly changing requirements. Once a landgrant had passed from the hands of the original grantee or his assigns, itwas treated as any other piece of land--it could be conveyed and this conveyance was recorded in deeds in the county court house." 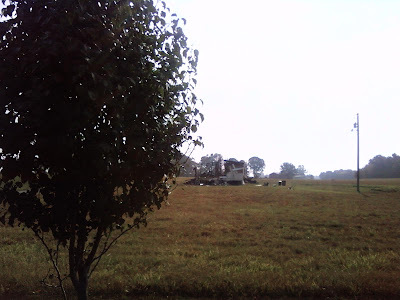 The way to track a piece of land is start with the current owner and work backward, she noted. "Of course, the problem is that land was cut up into smaller and smaller pieces through the years. 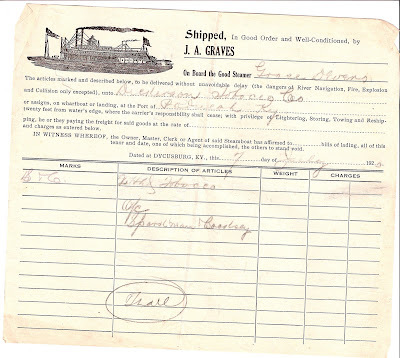 The way to track a ferry is to search the county court minutes as a ferry license was required. So, if you start with J.A. Graves in 1943 in deeds and county court minutes and work backward, you should find previous owners." Looks like fall is upon us. Everyone in this part of the county has been enjoying the beautiful weather. Attendance at Sunday School on Sept. 7 was 67, with more arriving for preaching services. It was good to see Shirley Stinnett out and about again. Also, Jeannie Griffin is out of the hospital. 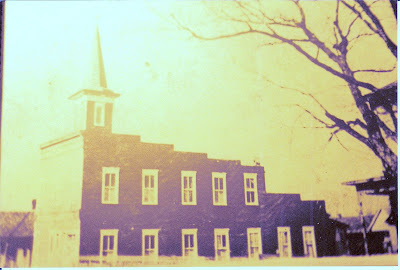 The Dycusburg school reunion was held at 1 p.m. on Aug. 31 on the lawn of the Dycusburg Methodist Church. Attendance was seemingly down over past years. Traveling the longest distance was Bill Dycus from West Virginia and Carol (Myers) Strilko from Illinois. Everyone enjoyed the food and fellowship. The annual L.B. and Sarah A. (Parsley) Patton family reunion will be held Sunday, Oct. 12 at the Fredonia Lion's Club Building. All descendants and friends of the family are welcome to attend. Doors open at noon, and a potluck lunch will be served at 12:45. Our sincere sympathy to Sarah Knight on the death of her mother Janet Knight. Sarah is the daughter of Andy Knight of Marion, Ill. She is the granddaughter of Bro. Lonnie and Joy Knight and Shirley Conrad. Happy birthday to Chase Matthews who turned 24 on Sept. 1. Chase was in an ATV accident two weekend ago, but fortunately was released from the hospital. He was banged up pretty badly, but is doing well. Thanks to Tina Cochrum, who witnessed the accident, for being with the family and for showing such concern. We're glad to see neighbors come together during times like these. Birthday wishes to Sissy Conyer (Sept. 4), Glynis Millikan (Sept. 5), Betty Williams (Sept. 7), Cindy Smith and Sabrina Hodge (Sept. 9), Reta Conger (Sept. 13), Cecil Travis, Jamie "Pug" LaRue and Paula Patton (Sept. 14), Dwayne Downing (Sept. 15), Frank Williams (Sept. 24), and James Berry (Sept. 29). Celebrating their wedding anniversary is Robert and Donna Millikan (Sept. 18). Carol and George Strilko of New Lenox, Ill., visited their family over Labor Day weekend. Makanda Rolfe spent Labor Day weekend with her great-grandmother, Barbara Ethridge and enjoyed playing with her cousins Dylan Strilko, Aliyah Frutiger and McKenzie Noffsinger. Dycusburg Day will be held Oct. 11. If you would like to be a vendor during the day, please call 988-2758. The group is currently looking to add additional food, craft and church vendors. A silent auction (with food, autographed books, CDs and restaurant gift certificates) and raffle (with a Nashville getaway package, gas card and large Avon basket) will be the highlight of the day. Also, an afternoon gospel singing by "Living Proof" and concert by "Gunner T" will round out the evening. More details will be published in the next few weeks. In a previous blog entry, we profiled W.S. Dycus (see here: http://dycusburg.blogspot.com/2008/02/profile-of-ws-dycus.html). 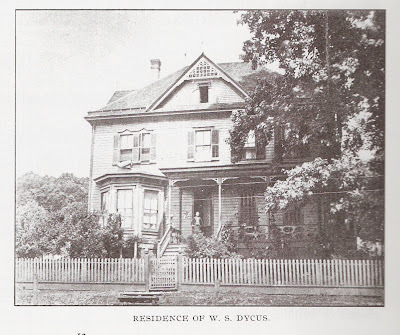 The old Dycus home in Dycusburg is now in ruins. See the photos of the current home compared with the grand home at Kuttawa that W.S. Dycus built. The homes were very similar in style. There's no word on the future of this property at Dycusburg. 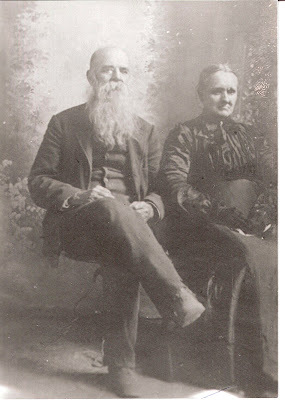 Ever since 1990, when Brenda Joyce Jerome, CG, published Crittenden County, Kentucky Marriages 1842 - 1865 and Abstracts of Wills Book 1 1842 - 1924, she said she has regretted doing only the will abstracts. "There is so much to be learned from reading every word of the will. Therefore, I am now publishing a book with full transcriptions of the wills. The 1990 book will not be reprinted in the same format," she explained. Crittenden County, Kentucky Will Book 1 1842 - 1924 plus five rejected/unrecorded wills is finished and will be available the middle of October. Included are the rejected/unrecorded wills of John Gregory, Samuel Nunn, Joseph Mercer, Nancy Wilson and Frankly Linn. As this is a very limited printing, it would be wise to reserve your copy now. To do this, send your name and address, along with a check or money order for $31 to Brenda Joyce Jerome, CG, PO Box 325, Newburgh, IN 47629-0325. Indiana residents must include $2.10 for state sales tax. The price includes postage. The soft cover book is printed on acid-free paper and contains 234 pages plus a 20 page full-name index. Included with the will transcriptions are the book and page number of each will, names of witnesses, date the will was produced in court for probate and the date it was recorded. 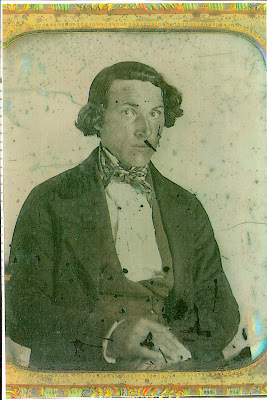 For more information, see http://wkygenealogy.blogspot.com/. In the late 1800s and early 1900s, coffins purchased through Dycusburg merchants came from a number of places. 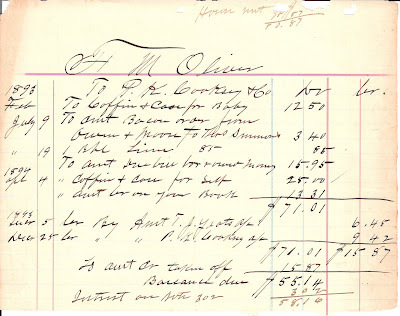 Often, because coffins were not planned purchases, these were the most urgent and necessary purchases, requiring notes to be sent to town to the merchant to get a coffin at once. In a review of loose papers, I found where F.M. Oliver purchased a coffin and case for baby in February 1893. Here's some "behind the scenes" photos of the Veteran's Memorial Marker being set in Dycusburg on July 3, 2008. Click photos for larger versions. A few copies remain of Dycusburg, Kentucky: A Glance at Her Past. If interested in obtaining a copy, e-mail matthewtpatton@yahoo.com and I can put one on hold for you. The Dycusburg Community Group will meet Sept. 13. Please mark your calendars. Happy birthday to Chase Matthews who turned 24 on Sept. 1. Chase was in an ATV accident over the weekend, but fortunately was released from the hospital. He was banged up pretty badly, but is doing well. Thanks to Tina Cochrum, who witnessed the accident, for being with the family and for showing such concern. We're glad to see neighbors come together during times like these. Makanda Rolfe spent the weekend with her great-grandmother, Barbara Ethridge and enjoyed playing with her cousins Dylan Strilko, Aliyah Frutiger and McKenzie Noffsinger. Dycusburg Day will be held Oct. 11. If you would like to be a vendor during the day, please call 988-2758. The group is currently looking to add additional food, craft and church vendors. A silent auction and raffle will be the highlight of the day. Also, an afternoon gospel singing and concert by "Gunner T" will round out the evening. More details will be published in the next few weeks. Magician Tommy Rushing (1 p.m. – 3 p.m.). Live Broadcast by WAVJ 104.5 (starting at 10 a.m. – noon). The book Dycusburg, Kentucky: A Glance at Her Past is now available for purchase for a limited time. 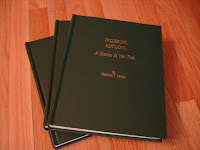 I have only a few copies left after the most recent printing. To reserve your copy, e-mail matthewtpatton@yahoo.com.